Dell Field is a community nature reserve and children’s play area with swings, see-saw, slide and spring horse, access from East View and Stevenage Road. The land is owned by North Hertfordshire District Council and managed by the council who pay a nominal yearly rent. The piece of land fronting Stevenage Road was let to the parish council in January 1981 and the remainder by agreement in January 1995. The Countryside Management Service (CMS) in liaison with the council and local community drew up plans for the nature reserve in May 1995. Gosmore village green with access from High Street and Maydencroft Lane is owned by the Parish Council. The council purchased the land from Herbert G Fenwick in July 1914 for £101.00 for use as recreation ground. An application to register as 'village green' was made on 7 June 1967 and this being undisputed became final on 1 October 1970. There are swings available for older children. Two of the seats were given in memory of former NHDC Councillor Alan Calder and Keith Robson-Elliott. Recreation ground is a community sports and children’s play area. The council with the consent of the Parish Meeting and the Hertfordshire County Council by order dated 10 May 1937 agreed with the vendor Miss Constance Jeeves to purchase the land for £250. The conveyance was signed at a meeting on 27 July 1937. There are pedestrian accesses from Mill Road, Townsend Place (private road) and Waterdell Lane. The vehicular access leading to the Bowls Club and Football Clubs is from Orchard Close off Mill Road. The children’s area includes roundabout, seesaw, swings, spring hedgehog, snake seat and five a side football pitch. Improvements including fencing, bollards and barrier also repairs to Football Club pavilion were carried out in 2009 with grant funding from Awards for All England and North Hertfordshire District Council. The Football Pavilion is owned by the Parish Council. The Broadmeadow estate land is owned by the Parish Council. In 2002 George Wimpey UK Ltd transferred two areas of land either side of Sycamore Close cul-de-sac adjacent to south edge of the estate which is landscaped with shrubs and trees and a bench has recently been provided. Pedestrian access is from London Road (B656), Sycamore Close and Larch Avenue. A small area at Rowan Grove which is landscaped with shrubs was also transferred at the same time as the above. 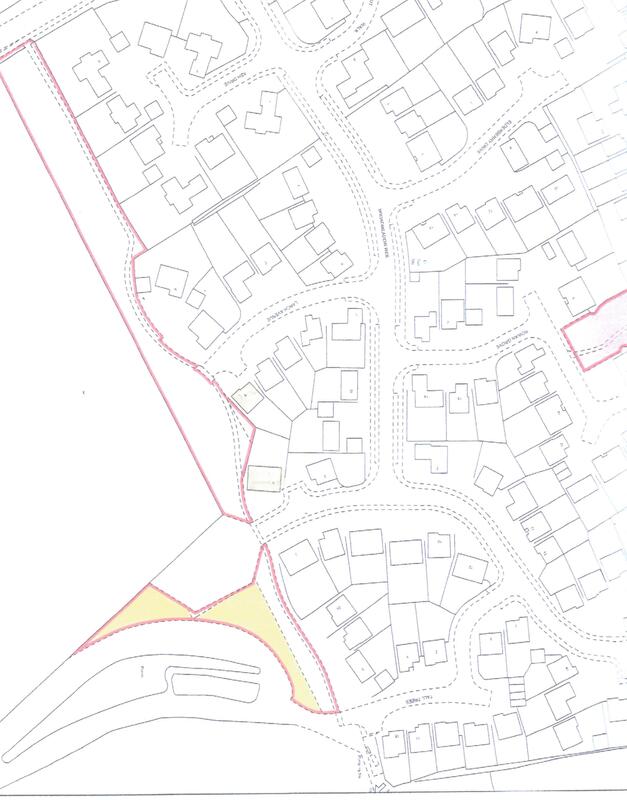 In 2001 Crest Nicholson Residential (Eastern) Ltd transferred a small grassed area adjacent to the sub-station in Sycamore Close. In 1969, eighteen old cottages that had been the centre of controversy were demolished and the green was formed. It is owned by North Hertfordshire District Council but the area including the footpath to the road is public highway. To celebrate the 900th of the church an oak was planted in 1987 and to celebrate VJ another oak was planted in 1995 and the peace-seat provided. The Millennium sign was given to the parish and erected in 2001. The council have also provided other items. Parish Council lease part of the Village Green. Much of the play equipment, seats, litter and dog bins have been provided by public grants but all are managed and maintained by the parish council. The notice boards on Rowan Grove, Gosmore and St Ippolyts village greens have been provided to help keep residents informed of our activities. Councillors regularly carry out a visual inspection of play equipment, etc. All the facilities are inspected annually and necessary repairs are carried out, which enables the parish council to obtain Public Liability Insurance. The parish council regularly reviews the facilities available and may add or change them in order to meet the changing needs of the community when funds are available. If you have any suggestions to improve any of the areas and or would like to comment on the facilities provided, please contact the clerk.